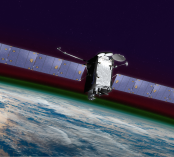 A NASA instrument that will provide unprecedented imaging of the Earth’s upper atmosphere has been successfully installed on the commercial satellite that will carry it into geostationary orbit some 22,000 miles above the Earth. 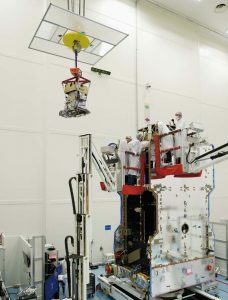 The Global-scale Observations of the Limb and Disk mission (GOLD) led by the University of Central Florida (UCF) and built and operated by the University of Colorado Boulder’s Laboratory for Atmospheric and Space Physics (LASP), features a collaboration with satellite owner-operator SES Government Solutions (SES GS) to place an ultraviolet instrument as a hosted payload on a commercial satellite. Marking a significant milestone in the lead up to launch, GOLD was integrated onto the SES-14 satellite in preparation for a series of environmental tests at Airbus Defence and Space in Toulouse, France. Airbus DS is building the SES-14 satellite for SES GS. GOLD is scheduled to launch on a SpaceX Falcon 9 rocket from Kennedy Space Center in late 2017. “Launch is almost within sight. The progress is exciting to see, and it’s getting even better,” said Richard Eastes, GOLD principal investigator and UCF scientist. “Integration of the GOLD instrument has gone even better than I’d ever hoped. That’s a tremendous testament to the ability of the instrument and the satellite teams,” he added. GOLD will make measurements from a longitude of 47.5ºW during two years of on-orbit prime mission operations. The SES-14 satellite has a life expectancy of 15 years. GOLD will capture never-before-seen images of the Earth’s thermosphere and ionosphere, detecting changes in temperature and composition due to space weather activity. This is a critical step in understanding how to predict the impact of space weather events on Earth. Some of the most dramatic space weather originates on the sun with ejections of plasma and x-rays into space. When directed at the Earth, ensuing geomagnetic storms have the potential to interfere with radio communication and disrupt GPS signals, impacting everything from airline travel over the poles, to high-tech farming, satellite TV programming, and cell phone connections. GOLD represents the first time universities and a commercial spacecraft operator will team up to enable a NASA science mission. Such a collaborative approach may blaze a trail for similar projects at universities nationwide. As a hosted payload, GOLD receives electrical power from the spacecraft, which also routes commands—originating at LASP—to the instrument and downlinks its images through a dedicated transponder. Hosted payloads enable government organizations—like NASA—to make use of commercial satellite platforms, an approach that provides a new avenue for relatively low-cost science opportunities in space. “Placing a science instrument in geosynchronous orbit on a dedicated satellite is very expensive. The GOLD mission would not be possible without the collaboration between SES and NASA,” said William McClintock, GOLD deputy principal investigator and LASP planetary scientist. In addition to providing the compact UV instrument—roughly the size of a microwave oven—LASP is providing project management, systems engineering, safety and mission assurance, instrument operations, and public outreach for the mission. Under the leadership of Eastes, UCF will oversee the project and build the data center that will process and disseminate GOLD science data. GOLD is a mission of opportunity and part of NASA’s Explorer Program. NASA’s Goddard Space Flight Center in Greenbelt, Maryland, manages the Explorer Program for NASA’s Science Mission Directorate in Washington. The Explorer Program seeks to provide frequent, low-cost access to space for NASA heliophysics and astrophysics missions requiring small to mid-sized spacecraft. Other members of the GOLD team include the National Center for Atmospheric Research, the University of California at Berkeley, Computational Physics, Inc., and the National Oceanic and Atmospheric Administration.